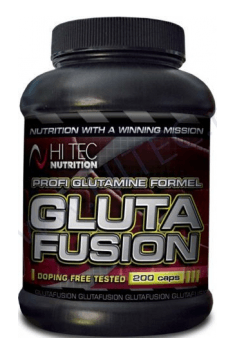 Glutafusion is a product increases in a short time, the concentration of bioactive L-glutamine in plasma and muscle cells, making maximum use of anabolic and anti-catabolic on the potential of the most important and strongest amino acid - L-glutamine. What is the function of the body of L-glutamine athlete? From a practical point of view, the above description is a kind of idealization of phenomena occurring in the body. The body, which reduces the impact of L-glutamine, is the liver. L-glutamine as well as other amino acids, undergoes a variety of metabolic changes in the liver. Furthermore, this amino acid (free form) is unstable in an aqueous environment and this is especially evident when the solution pH changes from acid to alkaline, as is the change in the chyme by the digestive system. Glutafusion composition has been designed to minimize the breakdown used in the preparation of glutamine α-ketoglutarate with glutamine dipeptide L-Ala-L-Gln maximum limits the decomposition of L-glutamine in the liver, which directly increases the bioavailability of the muscle cells. most stable form Glutamine is the chemical N - acetyl - L - Glutamine (NAG). Due to their durable structure NAG is not converted to inactive metabolites in the aquatic environment, and easily penetrates into the blood stream after passage through the gastrointestinal tract. In muscle cells, NAG deacetylation is so dramatically increases the concentration of the active L-glutamine. One serving (5 capsules) in the morning, after waking up, the second (5 capsules) after a workout. One serving (5 capsules) in the morning. The above-indicated method of use should bring the best results. The time of application should not be less than 4 weeks. Edible gelatine, anti-caking agent: magnesium stearate.